The concept for Duly Priced Drink revolves around the idea of ‘the workshop’. We aim to create a symbiotic environment within which the roles of facilitator and student blur, creating a platform for equality through skill and idea sharing. This making environment is considered equally important to the outcomes. The choice of a winter residency is significant as we intend to come together to drink hot beverages and make art and we hope that the use of real world, drinkable consumables associated with interaction will act as a catalyst for the intended discussion. Using such products as a mode of expression also forges connections between that artist and the world, as real consumable goods not normally associated with creative expression are engaged with in entirely new and surprising ways. There are three intended outcomes of Duly Priced Drink; these are a wall installation, a book, and a performance. The wall work and artist’s book will be created using prints produced during our workshop sessions and those interested in performing may be selected for the closing ceremony event. Each member is required to purchase a kit bag $20 which they will use on the day, and may be taken home after the workshop – we only ask that we may retain at least one finished image board from each participant to use toward the final exhibition. This way, each participant can take every single print they achieve during the course of their workshop instead of a cardboard that they can’t use unless they have a press. Come to the workshops dressed for mess! 82 Hanlons Road (North) Bilpin NSW. Brief: This class is designed to encourage construction as a departure point for drawing and painting. The resultant work will include 3D and 2D elements beginning with box studies and extending to stick/branch structures formed with string. Brief: This class includes individual and group outcomes. It combines multiple elements extending to suspension, winding, vessel sculpting or building with extra work encouraged for combination with the teen ceramic class for a future combined project. All participating students will be named and informed if the final work is included in an art-prize or exhibition. Brief: This class aims to prepare participants for thinking about ceramic items as sculpture and installation further to the mere functionality of the built or sculpted object. There will be individual and group projects working quickly to produce group work and carefully to make individual pieces. The 6+ ceramic classwork will be combined with the 13+ classwork to perform as an installation at a future event. All participants will be named and informed if the final work is included in an art-prize or exhibition. Brief: Children will undertake a variety of image making workshops on differing surfaces though all exactly the same dimensions. These squares will be installed on the wall to build an overall image over the weeks for which each child will have participated in a group project. The project will be dismantled at the end of term and all outcomes will go home after the final week. Brief: This course uses the silhouetted portrait combined with patterns similar to the cameo or much more contemporary depending on each participating artist. Fluctuating between the background and foreground of the subject, artists will produce a final work after the initial three week workshops. Workshops will feature wall-paper plate making and printing and more. Please supply the following materials: Student quality intaglio inks (smallest tubes) in Black and at least one other colour. BFK Rives or cheaper intaglio printmaking paper. Thin sheet of uncoloured clear plastic. Masking tape, Packing tape. Brief: This workshop supports the 4 week course outline above. It is a condensed version of this class. Ideally, the class will be made up of students undertaking the intensive class held on Wednesdays and newcomers. Please send me a message with your return email address if you would like to come along to this sale on the weekend. At this end of year studio clear-out I will have some brand new drawings for sale from my latest residency in Fowlers Gap, Broken Hill NSW. I will also have some works from my Counterbalance series and countless other limited edition hand made prints, drawings, paintings, sculptures and more. There will also be some other textile products (designed and sewn by Susan Leask) that have been extremely popular at the market sales of late. Fabric products include serviette covers, aprons in all sizes from toddler to adult and extra large, tissue box covers, cushions and more. A large portion of these items feature hessian for a more rustic appeal and even the bar stools that I have covered with this fabric looks great. Please send a message to katherine.kennedy6@hotmail.com if you would like to learn of the addresses of each studio. This workshop is back by popular demand though it is hosted at a different location to the last coffee collograph workshop. Patrons of the last workshop will find this next one different so you are most welcome to attend. Please save the date for enrolment day for Term 2, after school kids arts and crafts classes. Classes are tailored to the group and the individual. 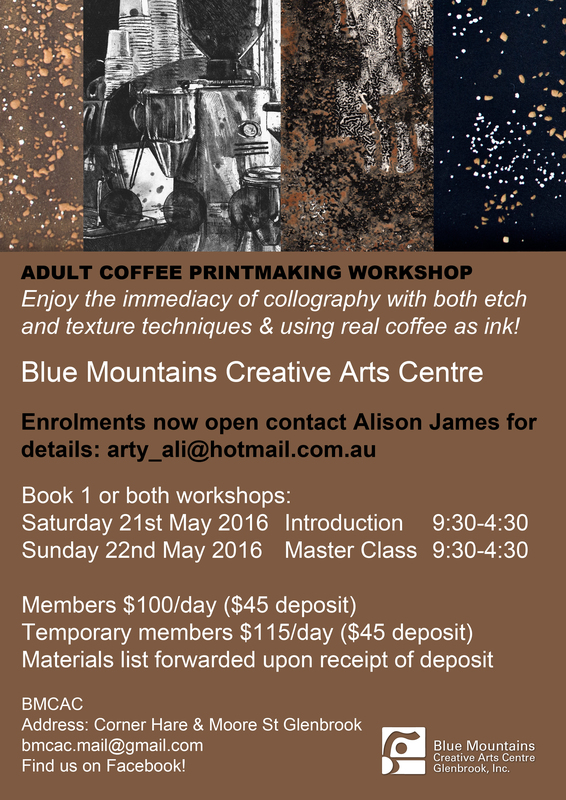 Please see Blue Mountains Creative Art Centre (BMCAC) for further details. IDENTIFY: PRINT YOUR OWN ZINE! Thanks to Photographer and Zine maker extraordinaire, Robert Musgrave, we have our very own IDENTIFY zine! Now this publication is not to be confused with an exhibition catalog as this will be separately provided within the exhibition space, listing the complete array of works on show. This zine is however a lovely insight and introduction to the artists and their varied responses to theme and of course some art-work-teasers. IDENTIFY is an exhibition of printmaking and ceramics but with a few surprises in store for those who visit the show at Monster Mouse Studio, Maud Lane, Marrickville. IDENTIFY officially opens at 6pm Sunday 27th September by guest speaker and printmaker, Michael Kempson. If you want your own copy of this zine, simply save this file to your own computer, open and print it double sided and in colour, fold and staple!